So in celebration of Thanksgiving in the US later this week and just generally being so thankful that you guys visit our corner of the internet, we're giving away one copy of a book from Ilsa J Bick's Ashes series. Not enough people have heard of this series, much less have read it so I'm here to promote the creepy love of post-apocalyptic fights for one's life in a world infested by cannibalistic teenagers! This contest is opened INTERNATIONALLY as long as The Book Depository ships to your country. One winner will get to pick their choice of either Ashes or Shadows and I'll get it shipped out to you so you can enjoy it for Christmas. I mean, what says "Christmas" more than people eating each other*? The contest opens at midnight eastern time on Wednesday, November 21 and will end at midnight on Saturday, December 8, so that gives you plenty of time to stock up on entries through tweets! I'll pick a winner about a week after and they'll be alerted via email. They will have 48 hours to let me know which book they would like and where it should be shipped. If they don't respond, a new winner will be chosen. Easy peasy. 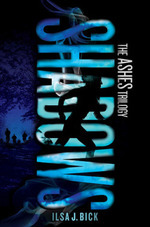 If you don't know anything about this series, you can visit GoodReads to find out more about Ashes and Shadows, keeping in mind that spoilers for the first book might be floating around on the page for the second. 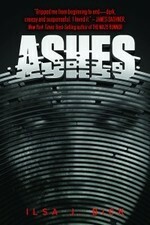 Or you can read my review of the creeptacular Ashes or the nail-biting Shadows. Good luck and don't like the nightmares take over!